available to all, the Franke A400 is for workplaces with 30-99 employees. The little brother to the Franke A600, the Franke A400 offers the same innovation of the A Series, in a more compact design. 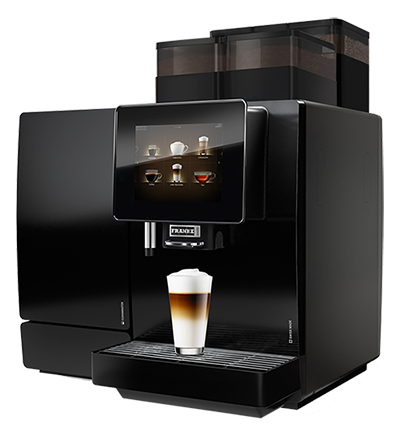 The perfect automatic coffee machine for medium sized businesses, the Franke A400 has been developed to make the finest coffee available in any workplace. Fully automatic, this machine is capable of dispensing up to 200 cups of coffee per day, with barista-grade coffee available at the touch of a button. Suitable for workplaces with 30-99 employees. As a smart office coffee machine, the intuitive touch screen makes operation simple and efficient. Ideal for self-service, users can browse all of the available options on the 8-inch colour screen with a customisable beverage menu. Smart technology enables the machine to be configured exactly to your office’s tastes and preferences. Whether your team like their coffee extra hot, or extra strong, after your 2 week coffee machine trial we’ll configure your machine exactly the way your team likes it. For outstanding hygiene and unbeatable simplicity and convenience, the Franke A400 has a fully automatic cleaning system that is executed every 20 minutes. As if prepared by hand, the Franke A400 blends components together perfectly to dispense first-class consistency from cappuccino to macchiato, and everything in between. Available in both FoamMasterTM and Milk system. Made from the best components, the A600 system incorporates a practical, easily accessible bean hopper that is easy to fill, and ensures the beans move optimally from machine through to cup. The precision grinding discs are also extremely robust with a long service life, resulting in consistent, uniform grinding results over time. Bringing all the innovations of the A series, the Franke A400 allows small-medium sized businesses to have a great coffee experience. Franke A400 not for you? Browse our other office coffee machines available to find the right one for you.